The mod adds to the game a few new weapons that shoot lasers. The use of such weapons in Minecraft Pocket Edition is very practical. With these weapons, you can destroy the blocks, kill enemy mobs, as well as produce their own food by killing animals in the far distance. Laser Laser Gun destroys a block that you are looking for. Laser Bazooka shoot laser bullets that explode when they touch the ground. Laser Gun Sniper Rifle shoot laser bullets that kill almost every mob when they get on the mob. Click the settings icon to open the GUI with full information about the mode and its settings. There are so many options for weapons, so you can personalize them. Laser Weapons also have a creative mode inventory. 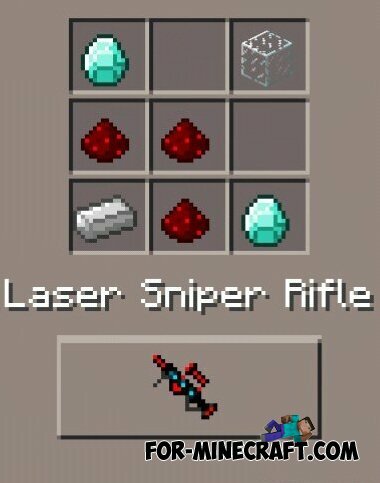 Laser Mod for Minecraft PE 0.10.X- Laser Bazooka shoots a bullet that explodes when it hits the ground. - Laser sniper rifle shoots a bullet that kills almost everyone whom she was struck. It was confusing but I figured it out.